National Dog Day is celebrating every year, that brings awareness about the ownership of every kind of dog breeds, both pure and mixed .This increase the opportunity of more dogs lives happy and safe life. Dogs help us every day in different roles as travelling companion for a blind or disabled person, as someone who gives comfort in any situations, as a rescuer, One who helps to solve/prevent crimes and drugs etc.. .
National dog day helps us to remind everyone the importance of rescuing dogs and spread awareness against dog fights. 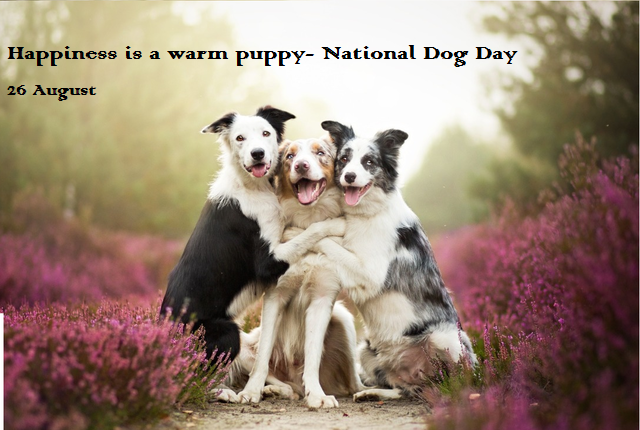 National Dog Day was founded in 2004 , It was founded by Pet & Family Lifestyle Expert and Animal Advocate Colleen Pagie. Colleen Pagie is also the founder of National Puppy Day, National Mutt Day and National Cat Day and many more days to bring attention to the unfortunate situation of animals and encourage that poor animal’s adoption. The date of 26th August is opted because on this date, Colleen's family adopted her first dog "Sheltie". She was 10 years old at that time. 1. Raise awareness and encourage peoples to adopt dogs rather than buying it from pet stores. 2. If anyone needs pure breed dogs, then look for pure breed rescue in city. 3. Spreading awareness to promote dog adaptation through tv programs and conducting various awareness programs though various media.